The No Barriers Summit offers a selection of specialized ‘tracks’ which were created to form a greater sense of community within specific interest groups. Joining a track allows you to participate in all No Barriers Summit experiences, while also partaking in exclusive offerings during Elective Activities and more. Joining a track happens during Registration. Connect with women and be inspired by entrepreneurs and leaders who will encourage you to dream bigger and push further. The No Barriers Women’s Track will introduce you to a community — your rope team — who will help you overcome barriers and encourage you to support others along their journey. As a Women’s Track participant, you will be joining a community of women that will help you reach outside your comfort zone throughout the weekend. The weekend will start with an open climbing session and inspirational speaker on Thursday from 4-6 PM. Meet the women you’ll be spending your weekend with at this session! Enjoy any activity that you would like on Friday and Saturday mornings, and meet up with your new rope team for afternoon activities on both days! On Friday afternoon, grab your new friends or make new ones and take an adventure on the Amazing Race! Your squad will band together in efforts of scoring the most points or completing each task in the least amount of time while encompassing a broad range of exercises ranging from mental, physical, creative and even technological components that requires a full team effort for success! On Saturday afternoon, join your fellow women in a workshop that will will teach you how to change your mindset, and to identify and restructure barriers in your life into opportunity to discover your true purpose. This workshop will be taught by Natasha Nurse, who is the founder of Dressing Room 8, life coach, radio and podcast host, and writer! The No Barriers Warriors Track focuses on how to build strong communities after military service ends. Hear stories of challenge and success from veterans who have been there and done that. Experience the No Barriers Life in camaraderie with fellow veterans from all branches of the military and eras of service. 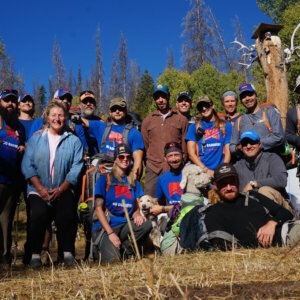 With team-building and personal growth activities, along with mentor-led discussions, you’ll benefit from the camaraderie and develop relationships in both veteran and civilian communities. On Friday, Warriors Track participants meet for breakfast before heading to the hills to navigate challenging activities in the high Sierras surrounding Lake Tahoe. Track activities are designed to push the team and include rock climbing, a summit attempt of a local peak, and an experience moving through mountainous terrain (glacier traverse or other). Specific activities to be determined based on snow and alpine conditions.